Contemporary Celtic Necklace For Women : LOVE2HAVE in the UK! One of our very modern and contemporary Celtic necklaces for women. 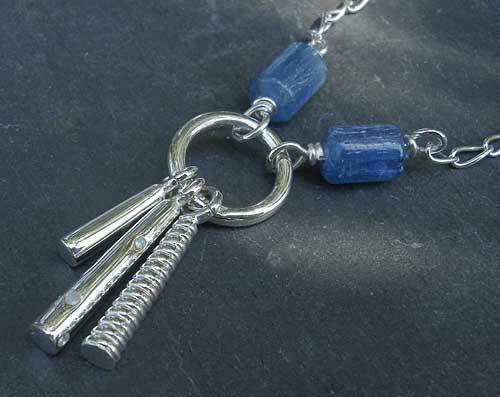 The beautiful modern design for this piece comes in sterling silver with kyanite and enamel detail. The pendant comes with a silver ring upon which three silver tapered lengths hang freely. They are of slightly different lengths and feature different surfaces - plain, dimpled and ridged. 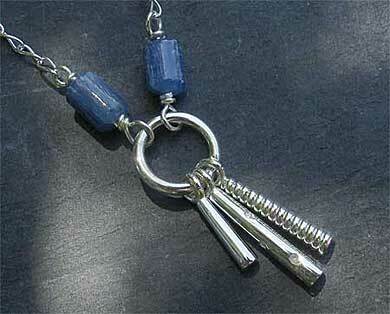 All the kyanite beads sit on the chain. The pendant measures a 3.5cm drop in total length and comes supplied with a 16-inch matching chain with other lengths available on request. 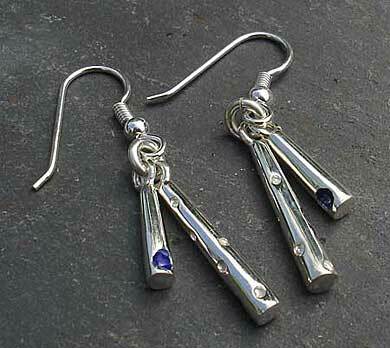 Matching Celtic earrings are also pictured. THIS NECKLACE IS A COMMISSION PIECE SO PLEASE EMAIL US FIRST REGARDING PRICE & AVAILABILITY.